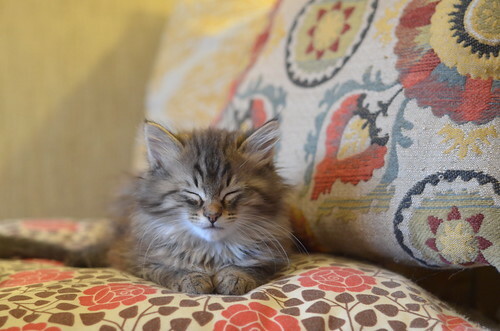 He is so serene in his floofiness. Also, I've been meaning to comment to tell you how much I love the pillows on your furniture. Covet! The Tiptons are the solitary sleepers! I think he has found his inner kitten. Oh my, I just want to squeeze him! He is going to be one HAIRY BEAST!! and I LOVE hairy beast cats! Floyd is one enlightened little kitten isn't he! Soooooo adorable. Beautiful even with his eyes shut. Is this the calm before the storm? Or after a storm of activity? I am one with the couch and no brothers. I am one with the couch...no bros....Where is Charlene to cuddle with? Pretty boy Floyd is one handsome young man, awake or asleep :) The Tipton brothers are just delightful...it would be cool if they can all go to the same fur-ever home! Wherever they go...there will be some lucky humans! Such a sweet little face! He totally melts me! May he be free from danger. May he be free from mental suffering. May he be free from physical suffering. May he live with ease. Metta, dear Floyd. He's visualizing the amazing family with which he will make his forever home! These Tiptons simply ooze charisma; wish I could snaffle up all three! Omigosh he is SO Zen in his pose. What a beautiful specimen he is. Your photos and captions always brighten my day - he's a beauty. I can't believe these sweet brothers! Each day the photos are more precious than the day before - this one just kills me. I love the Tiptons! His face! I swear it's kitten perfection. I've meditated on it.. and yes, these are the most adorable kittens!